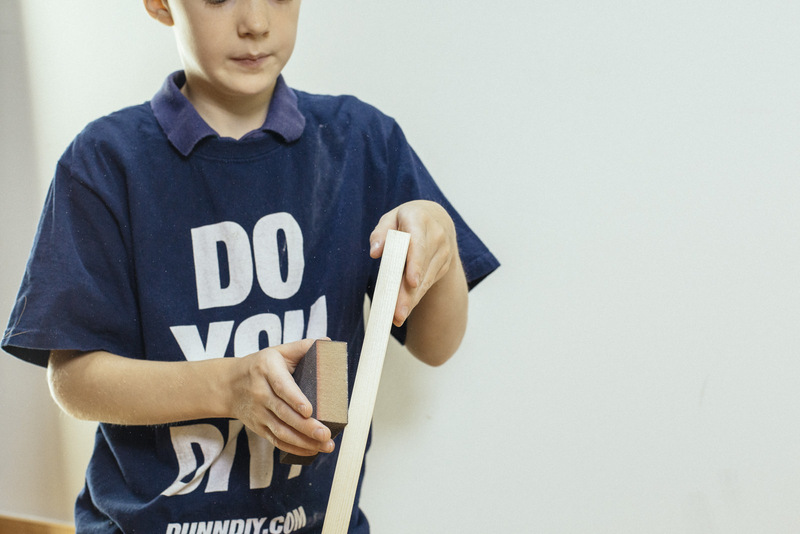 Fun DIY Projects For Kids Print this Project! It's that time of year again. Book reports, long division, and art projects. 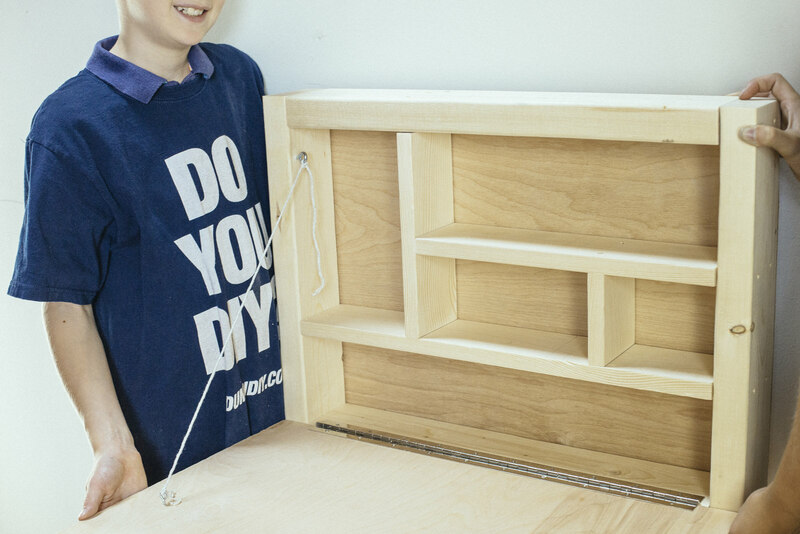 We've created a fun diy homework station that's a perfect fall weekend project. This desk is easy to make, takes up minimal space, and provides a personal little nook for your student to do homework. You may remember Logan from last year's Dunn DIY Flower Box post. 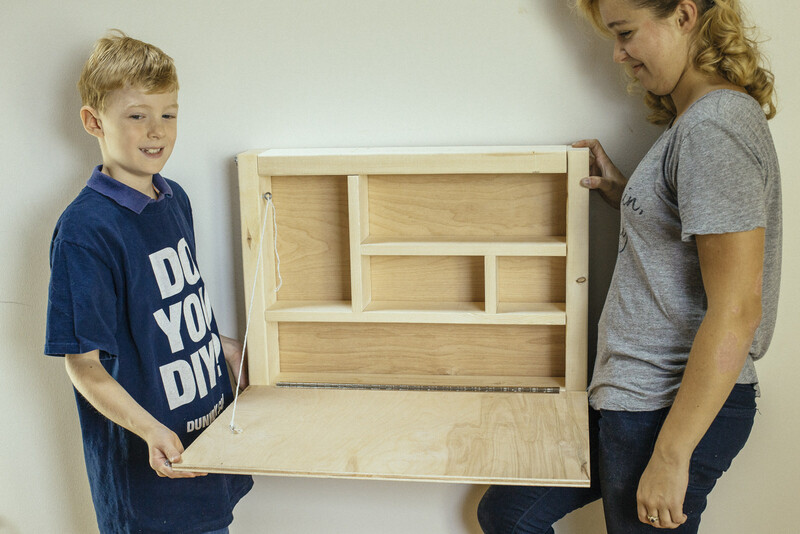 He's quite a carpenter and we loved getting to work with him to build this handy dandy homework station. Cut 2x4 into two 21” pieces and two 18” pieces. Cut 1x4 into one 21” piece, one 14” piece, one 4” piece, and one 9 ½” piece. 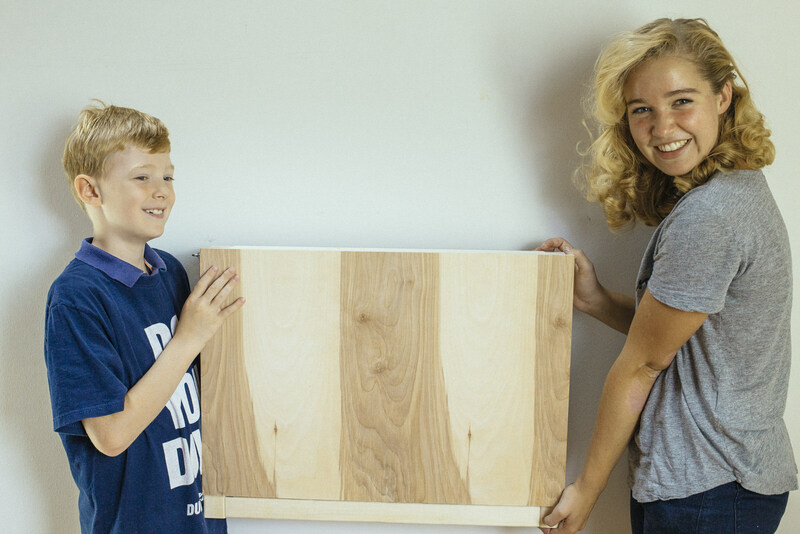 Cut plywood, or have Dunn cut it for you. 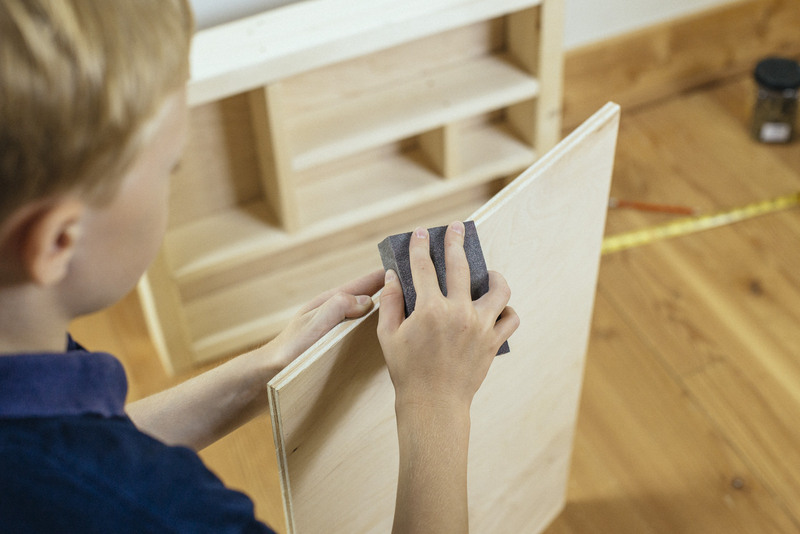 Cut 1/8” ply to 24x18” and cut ½” ply to 24x16 ¼”. Now it's time to sand the cut edges and any rough surfaces. Measure the hinge and mark at approximately 20”. Fold the hinge in half and cut through it with a hacksaw. This step requires either man power or patience. Again, this is a step for the adult! Position on bottom piece of 2x4 (one of the 21” pieces). Mark holes. Tape off the 1/16” drill bit to avoid drilling too deep. Predrill and then screw down hinge. Again, we did this in the wrong order, so the pictures don't match. But the good news is you won't have to go through the headache of bending your wrist backwards to get the desk secured. Put together the 2x4 frame. Pre drill with a 3/32” bit through the longer top piece into the end of the side piece and secure with two 3” screws. Repeat on opposite side. Pre drill through bottom pieces into both ends and secure with screws. 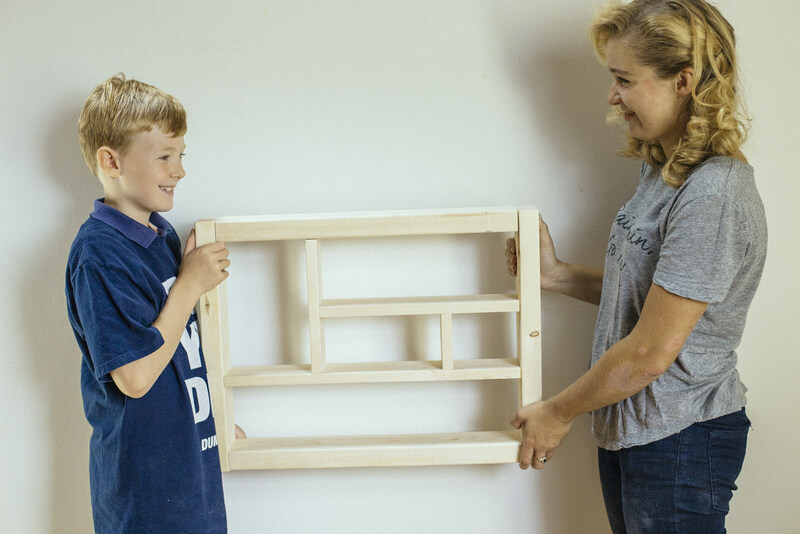 When the 2x4 frame is screwed together, fit 1x4 shelves inside. 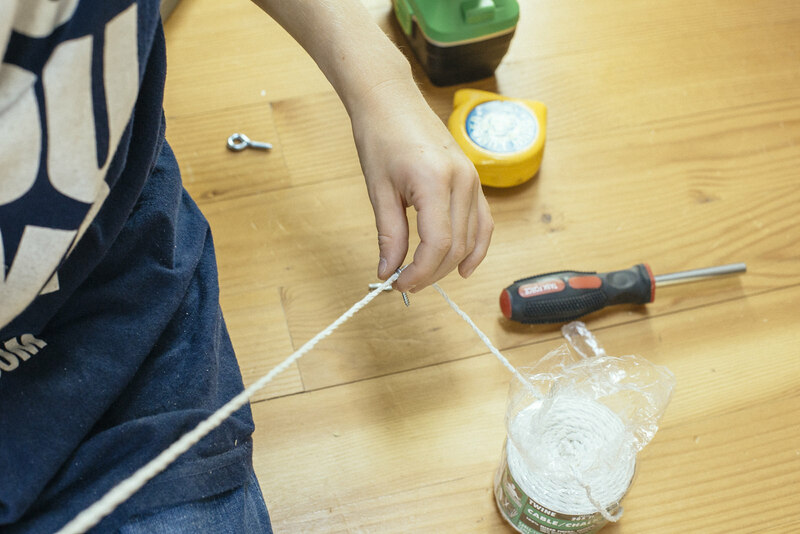 Measure and make sure everything fits when square. Make any necessary adjustments. Begin with the 21” piece and 9 ½” piece. With a pencil mark where the end of the shorter board meets the longer board. Remove from frame and line up along the pencil lines; predrill (3/32”) and fasten with two 1 5/8” screws. Fit these shelves back into the frame to double check they fit. It’s funny, but they always fit different after they’re screwed together. Place the other two pieces and mark where the 14” piece meets the 9 ½” piece. Remove from the frame, predrill, and secure with screws. Place back in the frame, fit in the 4” piece and mark for that. Predrill and screw in the last piece from both top and bottom. Fit all the shelves back into the 2x4 frame and mark where the ends of the shelves meet the frame. Make sure that all the shelves are level; this may require some wrestling. 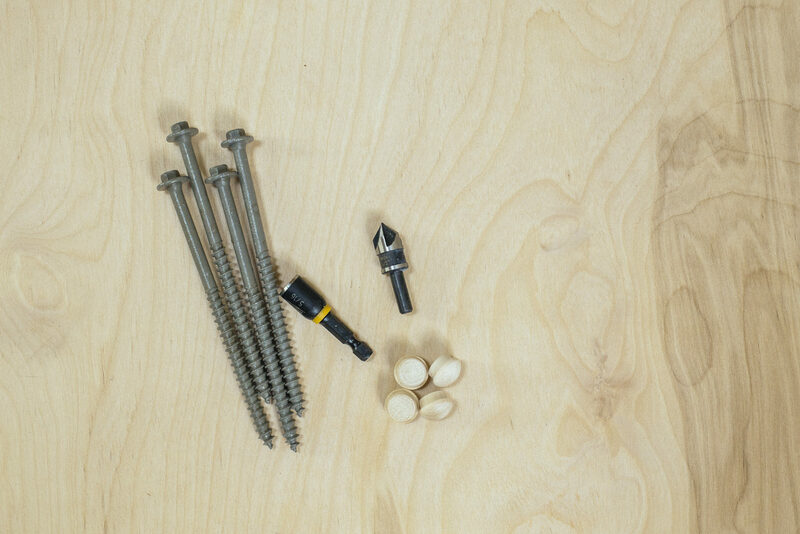 Predrill through the frame and secure with two 3” screws into the end of each board. Next attach the back. 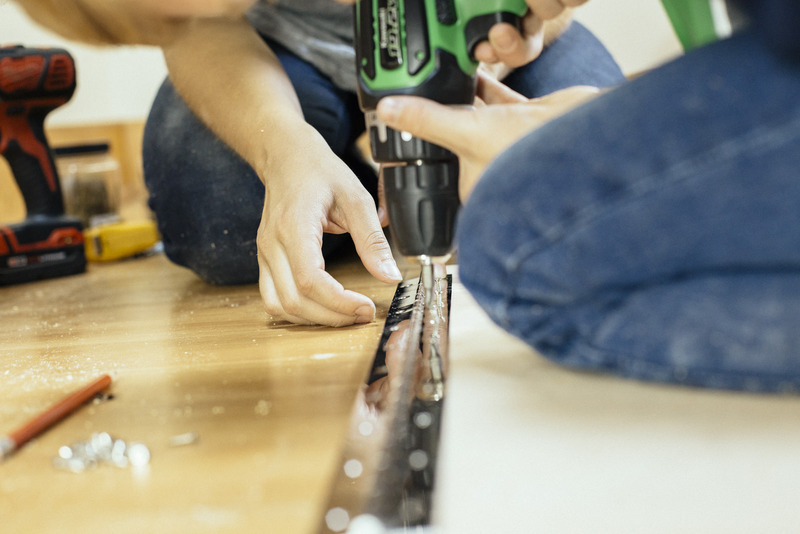 You can do this with nails or screws, but we recommend not using trim head screws because the plywood is so thin and they have a tendency to slip through. 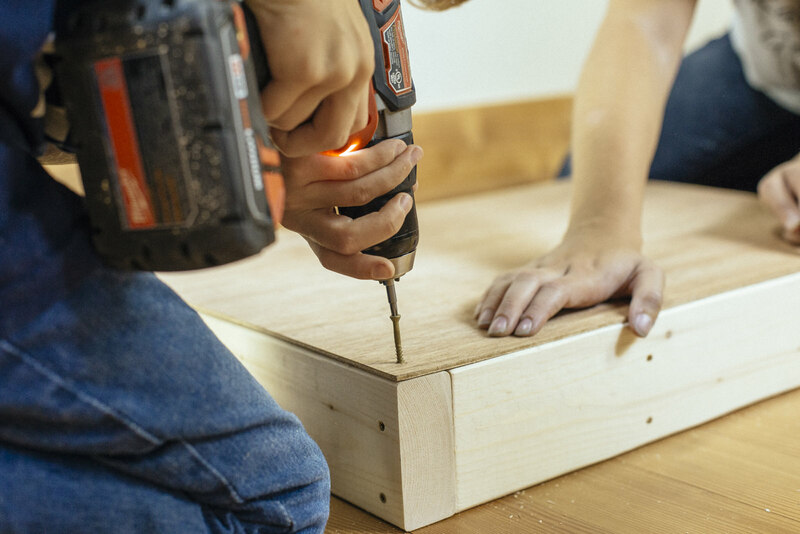 Make sure to predrill before screwing or nailing in order to prevent splitting the plywood. Back to the hinges. Position the plywood desk top underneath the hinges. You can use a scrap piece of 2x4 to hold the plywood at the right height. Mark holes. Tape off the 1/16” drill bit to avoid drilling through the plywood. Predrill and then screw down hinge. With the 3/32” bit predrill near the top on the inside of the frame, and on the desktop surface for the eye lag screws. Depending on whether your child is right or left handed you’ll want to do this on the opposite side so it doesn’t get in their way. Screw in the eyes by hand or with a pair of pliers. Tie a piece of cord in between the eyes to hold the desktop parallel to the floor. Predrill on the outside of the frame and the side of the desk top for the gate hook. Screw in by hand or with a pair of pliers. First take a stud finder and locate the position of the studs in your wall. 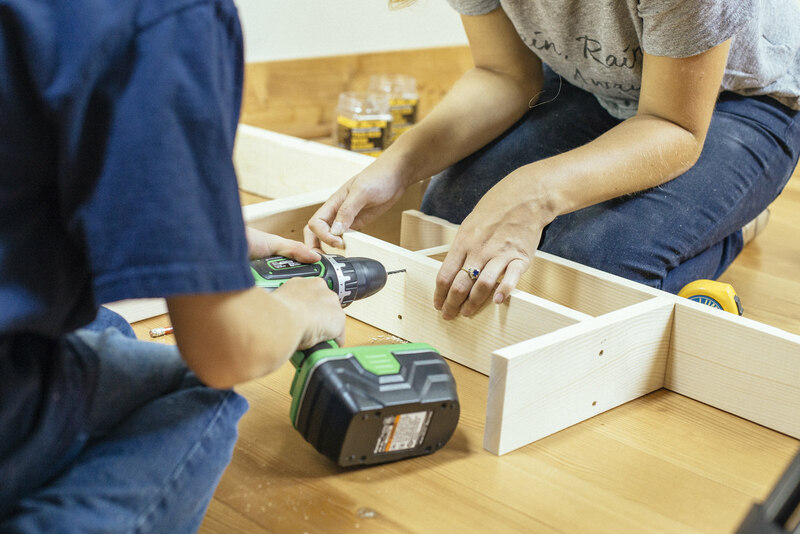 They should be about 16” apart, so you’ll be able to attach the desk to two separate studs. 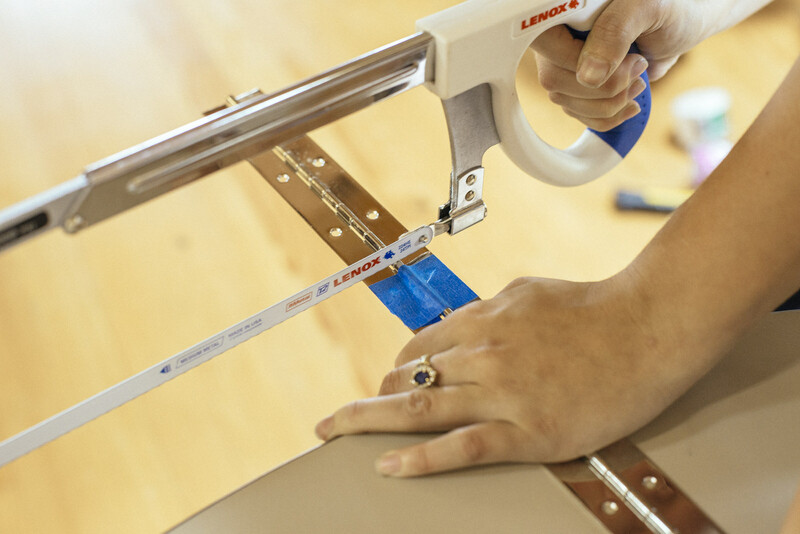 Position the desk on the wall and make two marks where the studs line up on the bottom and top of the frame. 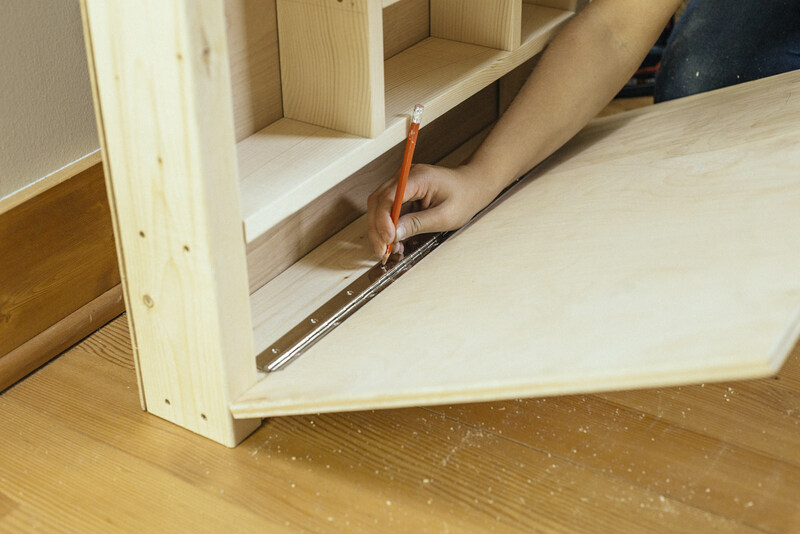 Predrill four holes through the desk with a ¼” drill bit and countersink with a ½” bit. 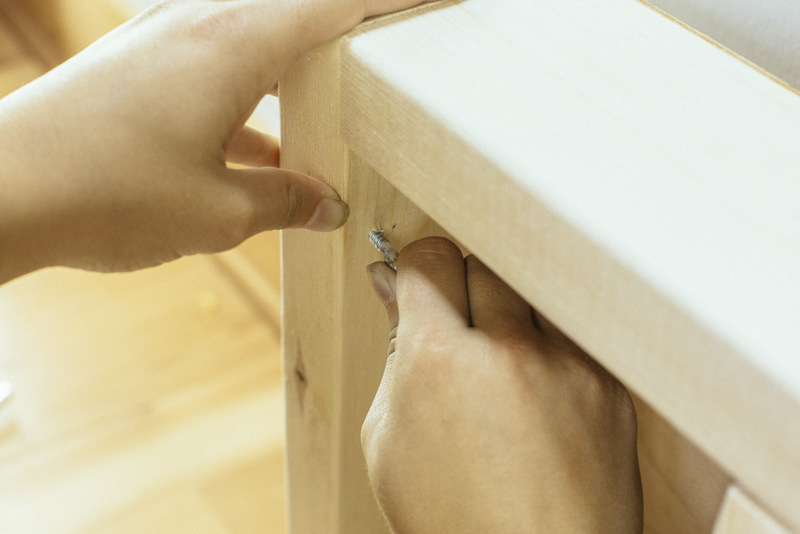 Make sure the desk is horizontal with a level. Using a 5/16” Nut Driver screw in four 5/16” x 5” Ledger Board Fastener through the desk frame and into the studs in the wall. For aesthetics you can put a ½” wood plug in the hole to hide the bolts. You might not believe you can create a gingerbread house with this much detail and charm—or customize it to your skill set or interest level. Our tutorial brings good news. Choosing the Right Fastener: Nail or Screw? Nail or screw? Screw or nail? This is the DIYer's perennial question. 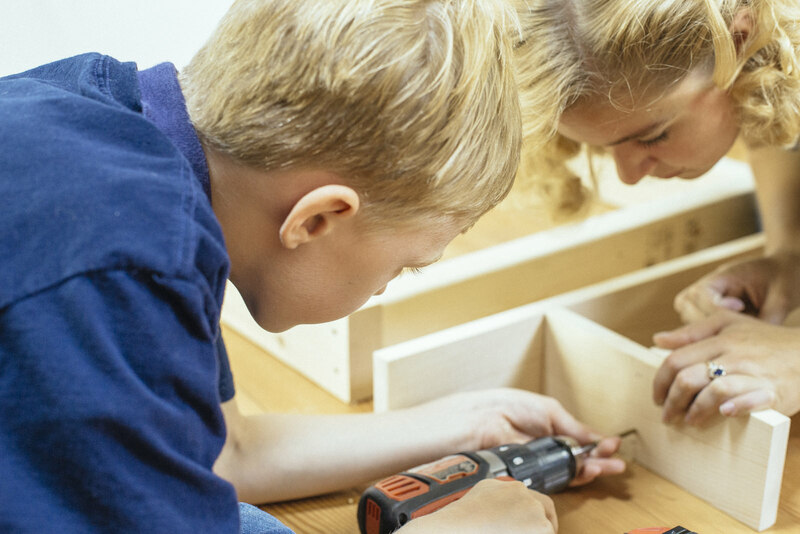 No matter what you're working on, choosing the proper fastener is an important step in ensuring your project looks and functions the way you intended. 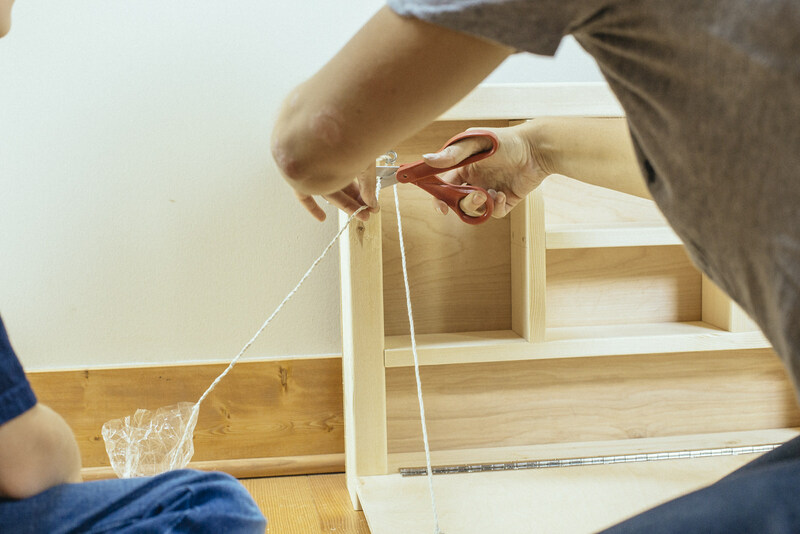 We wanted to create a boot tray that looked good, was built to last, and that could also be shaken out and vacuumed—and here's what we came up with!